Since moving to Hong Kong last month, I have been attempting to improve my nutrition by focusing on healthy cooking and exercising regularly (the latter is a bit harder to maintain). Compared to my previous abodes in California and New York, the Hong Kong organic health food scene seems to be still in fledging stages; however, it is growing quickly. Some of the higher end grocery stores have a budding selection of organic food and gluten-free products. There are also some specialty shops, such as SpiceBox Organics (USDA certified organic store), where I had recently picked up a few ingredients to play around with for the upcoming holiday season. 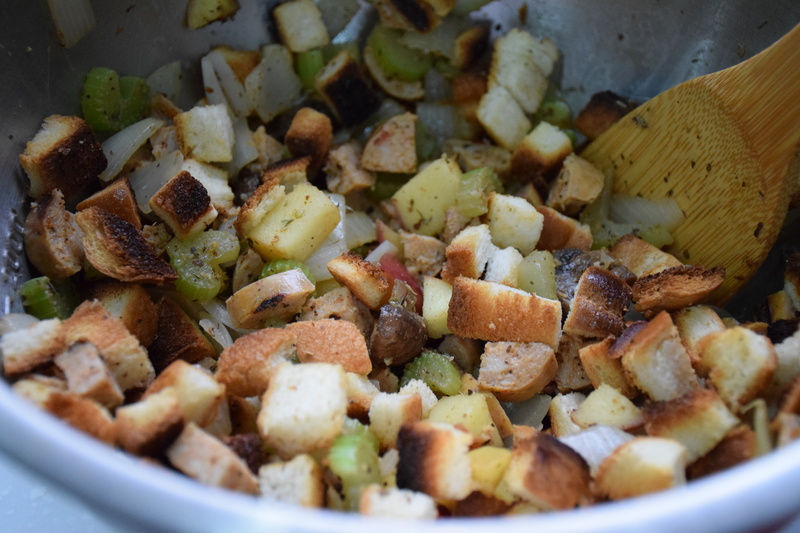 With Thanksgiving approaching in a few weeks, I started to look into various stuffing recipes. I was presented with the challenge of making gluten-free stuffing. I set up my home test kitchen to experiment, and went about to research recipe ideas. It seems everyone has their own favorite versions of stuffing, whether it be the ingredients or actual form it takes (roasted pan or baked balls)… but like with anything in cooking, the key should be just add what you love. Apples, fennel, andouille, chorizo, bacon, hazelnuts, walnuts… the list can go on. 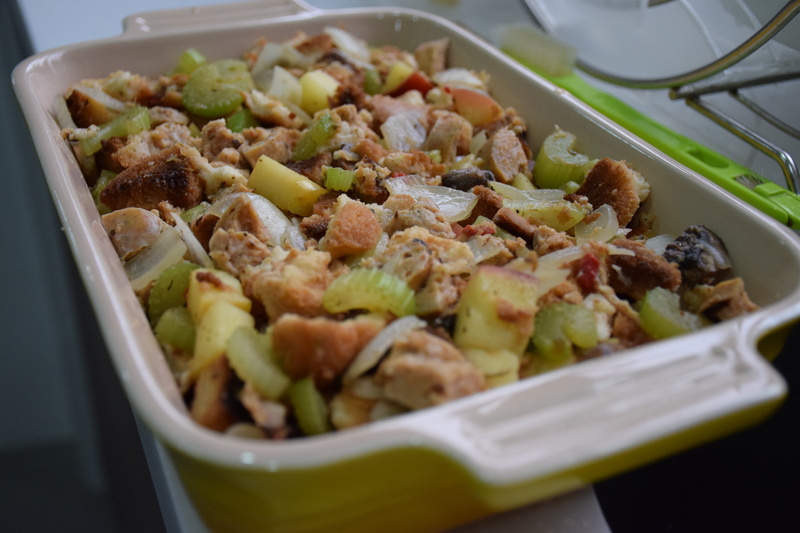 For simplicity’s sake, I decided to start with a classic American recipe (celery, onions, sausage, apples). Here, the use of gluten-free white bread was really the only tweak needed to make it a gluten-free version. White sandwich bread is ideal for making stuffing because the mild taste will not overpower the other ingredients. For a list of HK’s gluten-free stores and bakeries, this link may be helpful. If you are unable to locate gluten-free bread, another alternative is to substitute in cornbread… although that richness may defeat the purpose of a “healthy stuffing”. Another option to go gluten-free would just to be skip the bread altogether. 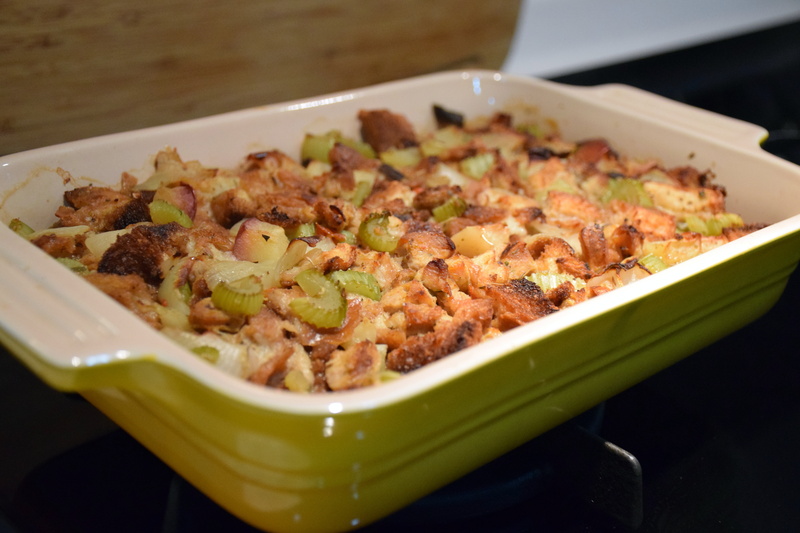 I think this stuffing recipe can be easily served in the absence of bread and stock. This is a similar concept used in this Whole Roasted Chicken recipe that only has vegetables for stuffing. My next gluten-free stuffing recipe attempt uses cauliflower: Caulifower and Hazelnut Stuffing. Preheat oven to 325°F (160°C). Divide bread cubes between two large baking sheets. 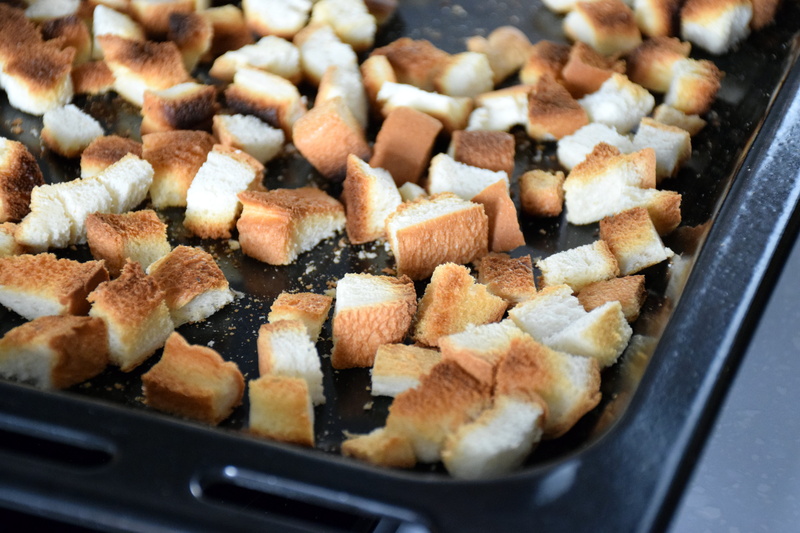 Toast until bread is golden brown and dry, about 30 minutes. Remove pans from oven and allow bread to cool. This can be done a few days before and stored in a plastic bag at room temperature (just ensure bread is completely cool and dry). When ready to use, place the bread cubes in a large bowl. 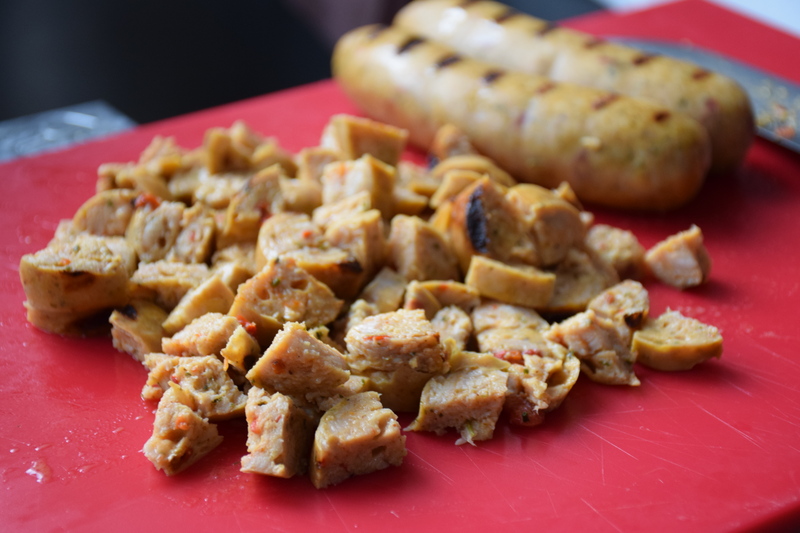 Cook your sausage (sauté, grill, microwave) and then cut them into small pieces and set aside.. I never miss a chance to use my grill pan as I love the dry heat when cooking meat, as it just feels a lot healthier without oil and fat splattering everywhere. But if you don’t have a grill, just heat 2 T of olive oil in a large pan and add the sausage. Use a fork to break the sausage into small pieces as it cooks until no longer pink (about 3 minutes). Remove the sausage using a slotted spoon, and put aside on a plate. 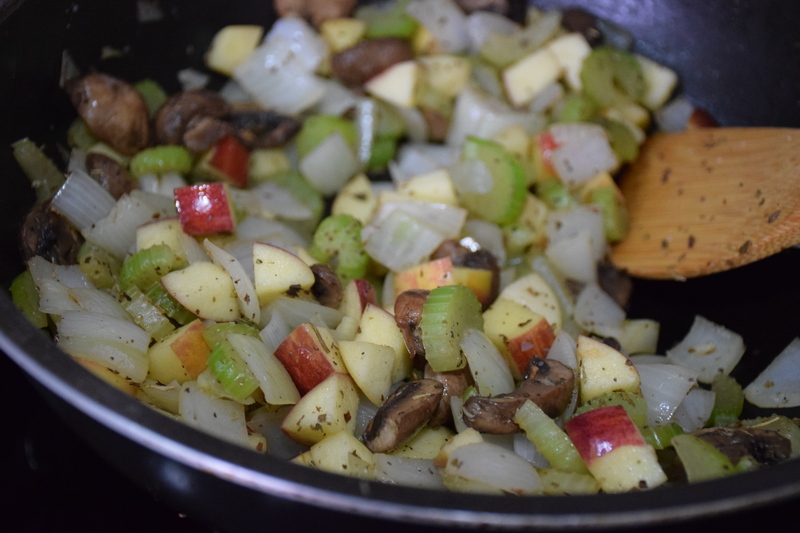 In the same large pan and using the leftover cooked oil, add the celery. Cook for about 2 minutes until it just begins to soften (about 2 minutes) and then add the onion and apples. Cook for two minutes, continue to stir frequently. Add the mushrooms, garlic, herbs, salt, and pepper. Cook until the vegetables and fruit are soft and aromatic. Spoon vegetables onto the bread cubes. Add sausage pieces and toasted nuts and stir. Now this is the tricky part. We are going to pour the broth over the bread − the goal is to get moist but not soggy bread cubes. It really depends on what kind of bread you are using, so just start by adding 1/4 C at a time. Stir until cubes absorb the broth. Add additional broth if bread continues to be dry. It’s okay it the some of the cubes fall apart. 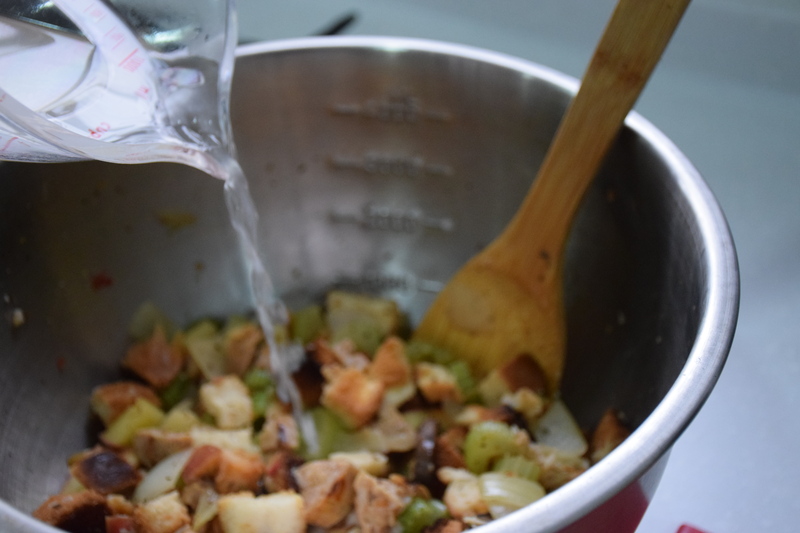 Transfer stuffing to a greased 9×13-inch baking pan. Cover pan with aluminum foil and bake about 30 minutes. Remove foil and return pan to the oven and bake until golden brown, about five minutes.